April is National Autism Awareness Month and April 2nd is World Autism Awareness Day. You can learn more about Autism and help to raise awareness through a variety of ways. 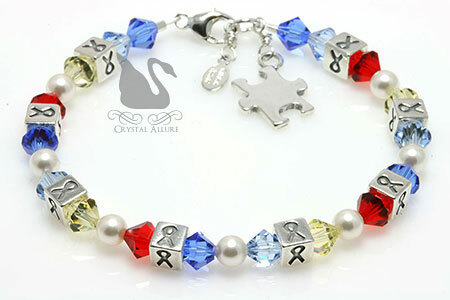 One sparkling way is with the Crystal Allure Autism Awareness Ribbon Bracelet (BA033-AU)! This design evolved from the popular Organ Transplant Awareness Ribbon Bracelet (B105) but it incorporates the nationally recognized Autism Awareness Ribbon colors of red, yellow, dark blue and light blue. This handmade beaded awareness bracelet features red, yellow, dark blue and light blue Swarovski Crystals with white Swarovski Pearls accenting sterling silver awareness ribbons beads. Finished with a sterling silver Autism puzzle piece charm and signature jewelry tag. Measures 7-1/2". 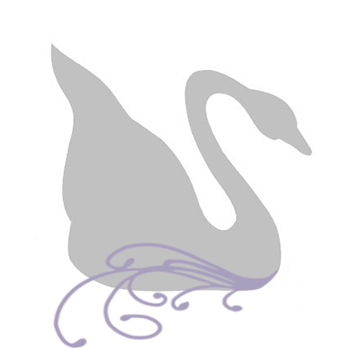 April is like the other months of the year, in that it is, host to many other awareness causes. Throughout this month I will be highlighting those causes in awareness jewelry, along with, new Spring Beaded Jewelry!